I first imagined the Hamsa Flag in 2008–when I was 20–while reading an essay in the New York Times about a one-state solution in Israel|Palestine. Until then, I had only known of the two-state solution, and had abided by the idea that it was integral to the so-called peace process. As soon as I finished the article, I remember having an immediate, almost bodily response: for such a utopia to exist, the flags of both sides would have to be abandoned and a new flag introduced. I was struck by what I saw as a design flaw intrinsic to the conflict. The very graphic design of the flags representing both peoples was preventing the path toward civil rights, self-determination, and peace. At heart, it was a simple thought. I felt that most Israelis would never agree to live under the Pan-Arab colors of the Palestinian flag and most Palestinians would never agree to live under or near the blue and white–the Magen David– of the Israeli flag. As soon as the thought came, the symbol followed: the hamsa. It was instinctive, intuitive, and absolutely clear: this was the natural symbol of the merging of two peoples. It was a suggestion far more elegant than the original article’s suggestion of renaming the land Israstine or Palisrael, and, I learned, a suggestion that had a history. It was aligned with a far more broadly respectable group of thinkers, activists, theologians, and idealists from all backgrounds. The proponents of an egalitarian one state (and a binational state) in Israel|Palestine include Jewish philosopher and theologian Martin Buber, who co-founded the organization Brit Shalom in 1927, advocating for Jewish-Arab worker cooperatives on a platform of civil rights for all in a binational state; and the late Palestinian cultural critic Edward Said, exiled in 1948, who also wrote about the value and pragmatism of the binational dream; as well as other thinkers across the century from Hannah Arendt to Judith Butler. Why this symbol? Jews, Muslims, and Christians, Arabs, Turks, and Kurds, people in the Balkans, and across North Africa have been wearing the symbol as a spiritual emblem for hundreds, if not thousands, of years. This fact sank deep into my own ancestry as a Sephardic Jew, whose family had descended from Spain and had been in the Mediterranean (in modern-day Turkey and Greece) for over 400 years following their expulsion during the Spanish Inquisition. Why a Flag? Why create a new symbol so easily associated with militarism, colonialism, dogmatism, and hyper-nationalism? How to do it without irony? How to do it without replicating these violent structures and thoughts? I felt a flag was necessary because a movement would be necessary, because there are flags of peace and resistance, flags of the imagination, flags that can symbolize things we cannot yet articulate. The world to come. The flag was not designed as a reaction or to be entangled in the dialectic of Jew and non-Jew. It was designed with the hope of bypassing dichotomies entirely, to set the stage for something new. Why a Flag? Why create a new symbol so easily associated with militarism, colonialism, dogmatism, and hyper-nationalism? Where did this symbol come from in me? I had seen it in my apartment growing up. It was the gift that hung on my bedroom wall–mailed to me multiple times, on multiple birthdays–from my Turkish-Jewish grandparents living in a suburb of Tel Aviv. It was a symbol of my Sephardic heritage. My paternal grandfather’s family had been expelled from Spain in the 15th century. My grandmother, who now lives in Ohio, told a waitress recently that she was from Córdoba, rather than Istanbul, her birthplace, or Tel Aviv, her home of over 40 years. This is a common sense among many Sephardic Jews: our stories are different from the stories of Ashkenazim and the memory of our roots is never far off. After the Inquisition, my family had fled to the Ottoman Empire, which had famously opened its arms to the Jews in flight. The next 400 years were also unique in Jewish history. Even without equal rights, Jews in the Ottoman Empire were able to practice their rituals mostly without the fear of persecution that their cousins felt in Europe. And what’s more, under the banner of the Ottoman Empire they often lived in close cultural, personal, and economic ties with Muslims and Christians, often studying in the same schools, often co-running businesses. My grandmother tells stories about the Catholic school she attended in Istanbul. In her memory, the school was one third Muslim, one third Catholic, one third Jewish. She tells the story about a teacher there, a nun named Soeur Emmanuelle, who asked the whole class to write and sing the Shema in 1944 as a prayer on peace and safety for their cousins in Europe. In other words, it couldn’t have been easy, but we all lived together with our separate languages and rituals in relative peace. And, most importantly, this apparent coexistence was the norm. Yet this normalized experience of coexistence changed in the 20th century when the Ottoman Empire fell apart and Turkish nationalism blossomed in its absence. The rest of the Ottoman territory was annexed and broken up by French and British forces, forming the states we know today: Syria, Lebanon, Jordan, Israel, etc. In this time, in the rise of nation-states, my grandmother learned Turkish. She was the first in her family to learn the language, after 400 years living in and around Istanbul. Up to that point her parents spoke Ladino, Greek, French, and Italian. Turkish was never necessary. The tribes could co-dwell even with distinct linguistic communities. Her own personal transition into nationalized culture was iconic in our family. She was the Valedictorian of her high school class and, for that reason, was asked to deliver flowers to the revolutionary leader Mustafa Kemal Atatürk when he came to visit. The hamsa extended its fingers in my mind. So I sank deeper into my past. I studied Ladino (Judeo-Spanish), the cousin of Yiddish, spoken by Jews throughout the Mediterranean. I learned about its history of sacred and secular poetries–often belittled in relation to Yiddish, the language of Ashkenazim. I learned about Shabbatai Tzvi, the Jew from Izmir and famed “false messiah,” who was banished from the Jewish community because, among other things, he had mixed Jewish and Muslim rituals. I learned about the profound irony of my last name, Haviv, which had been translated from its Arabic spelling, Habib, in 1948 (and previously from its Turkish spelling Habip). I thought of this with the backward glance to the 1990s and early 2000s narrative of terrorism, which made suburban Jews I knew fear and hate Muslims and Arabs. This was not just the case in the orthodox shul I briefly attended when I was young, where I heard the first notes of fire and brimstone Zionism, but also in hippie, “peacenik,” guitar-swinging Reform synagogues. Fear and xenophobia was the norm. On the news, we were taught that there was a strict and violent dichotomy between Arab and Jew. This never felt right when I heard it, although I had no language or evidence to explain it. In my twenties, it became easier and easier to learn the words of refusal: how could that be the case if my last name was Arabic and is now Hebrew? How could this be the case if many of the great Jewish scholars–including Maimonides himself–wrote in Arabic? How did the conflict between Muslim and Jewish culture make sense if my grandmother would say mashallah as often as she said mazal tov? On the news, we were taught that there was a strict and violent dichotomy between Arab and Jew. This never felt right when I heard it, although I had no language or evidence to explain it. Our language and rituals were never pure. They were syncretic, and had always been; we were always ciphers, we were never absolute. In my mind, this false sense of purity remains to this day one of the fundamental barriers to peace. Although my family seemed “European,” something was different. My name told me as much. My ancestral myths always spun glorious tales of Sepharad, of al Andalus, of Jews and Arabs, philosophers, poets, alchemists together…But in the Promised Land, it was precisely this part of the Levant that seemed farthest away. The living manifestations of Old Levantine World (the native Muslims and Christians, the Arab Jews) either found themselves completely transformed or walked on as ghosts…. Again, my name provided a clue: In it, Hebrew and Arabic not only existed side by side, but were incorporated into one. My heart and my head, my name: all spoke to me of the possible, while everything around me dictated the impossible. 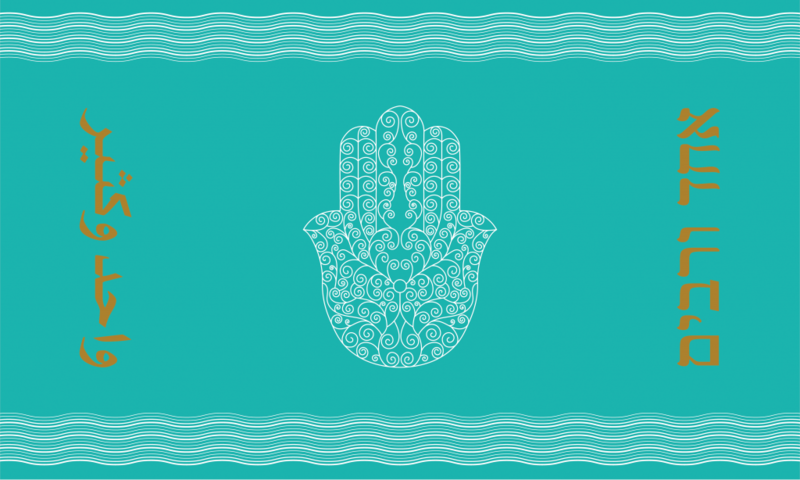 As I read more, I began to think of this hamsa flag as weapon against binaristic thinking of all kinds. I wondered how it could help dismantle these false binaries Arab and Jew to begin with and maybe make more intimate the American constructs of Muslim and Jew. I saw it as an icon that showed the slipperiness of our origins, the violence of the language patrolling the borders around these imagined origins, and, above all, in the state-disseminated language about “the arabs.” I began to think of what a symbol like this could mean in a broader sense. Could it be the symbol of a Muslim/Jewish unity? Again, of a binational state? Or, more specifically, a symbol of Sephardi/Mizrahi culture and resistance? Could it be a symbol of Mediterranean culture? Or another broad culture that defies binaries and tribal boundaries? Or, finally, as my father–a veteran fighter-pilot in the IDF–had daydreamed: a federation of Middle Eastern states. He always thought that Israel’s further acceptance of its “Middle Eastern-ness,” as he put it, should bring it closer to its neighbors, to its truth, to itself. 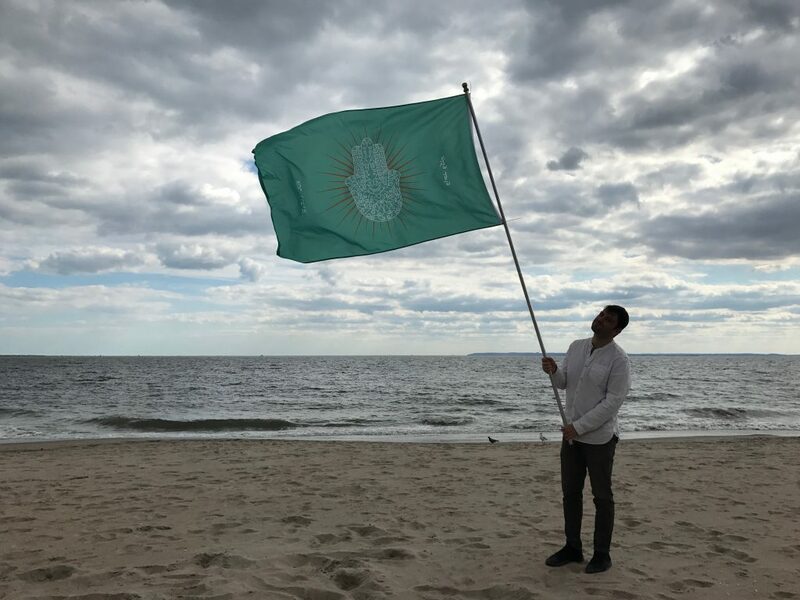 Again, I saw the flag as a meditation on the conditions of hybridity that my ancestors came from: cobblestoned streets of Islamic Spain to the islands and cities–Salonika, Athens, Istanbul, Izmir, Mersin, Damascus–that thrived under the Ottoman Empire. These–all prior to the formation of the Israeli state–were the conditions I imagined would have to be recreated in the utopian end-game of Israel|Palestine. I felt that we had taken a detour in the twentieth century away from our roots. Somewhere in my mind, between hope and despair, the flag flew. Yet however elegantly this symbol presented itself in my mind as a container for this hope, this abstraction–and the flag I imagined it on–could only invoke a future social and political form that I could not name, and maybe one I could not even comprehend. For starters, I still did not know what a one-state or binational state would or should mean in practice. I let all these possibilities sit in my mind for years, unactivated, a private question of identity rather than a public question of action. I lived my secular and relatively privileged American life avoiding every connection to “that place” and the urgency of these questions. And yet, no matter how much I placed the subjects of ancestry and fate to the back of my mind, sometimes (and with greater and greater frequency as the years passed), when the news was particularly damning and horrific, the hamsa flag would literally flash before my eyes. When a friend told me about how their Palestinian family could not visit their homeland since they were displaced in 1948, while I was able to go there freely–the hamsa flashed in my mind. When I learned that I could not visit a loved one in Lebanon and Kuwait because of the city of my birth–the hamsa flashed in my mind. When I saw settler violence, when I learned about the flaws and deceptions of the Israeli dream, the exploitations of Mizrahim, Ethiopians, Jews of Color–the hamsa flashed in my mind. Whenever I felt the pain of this “homeland,” the hunger to heal my Jewish soul–the hamsa flashed in my mind, extending its long symmetrical thumbs toward to the borders of sense, of identity, of family history, of my small life compared to my ancestors (from my great-grandfather, an Ottoman officer, who had escorted Theodor Herzl on his first expedition to Palestine and had advised him against his choice of homeland, to my great grandmother who had allegedly banned talk of God in her home at the turn of the twentieth century). But none of these conversations and encounters with my friends or the specters of my ancestors impelled me to act on this idea. They all just heightened my sense of confused, disjointed connectedness that I had been battling since I moved from Israel to the United States at the age of three. As an American, I did not feel like I had the permission to take this on as a political project. This feeling changed in 2014 during the siege of Gaza. In response to the pressure of this moment and the rage and betrayal I felt, I got involved in a new organization called IfNotNow. I was invited by a friend who had been inspired by my ruminations on the hamsa flag and I quickly found myself in a heated conversation about what Jews could do to stop this reality. Community–even in this space of polarized “not in my name” rage–was still not clear to me. There were walls of non-belonging between observant and non-observant Jews, liberals and anarchists, over-educated and working class Jews, etc. Through this I also learned about older organizations like Jewish Voice for Peace and JFREJ. Within this context, and the deepening knowledge of the open-air prison in Gaza “we” had created my rage began to feel unplaceable, again, and began to push my sense of disconnection to its farthest limit. I was willing to give up on the Israeli government and ask hard questions about what was being sacrificed by putting our faith in its military industrial complex. I began to question the very basis of Zionism as envisioned by Herzl. So I began to dream again, and the hamsa opened in my mind one more time. My friends with whom I was organizing encouraged me to develop the flag as symbol of a movement to come, even if the movement seemed far off, or impossible to name, or just plain impossible. Even if I was an absurd–or the wrong–person to take it on. Yet as I got closer to this project, working with different collaborators in 2014 and 2015, my feeling that I did not have true permission to work on the flag became even more and more acute. I still did not identify as an Israeli, even though I was born in Israel, and I still felt that the conversation belonged to Palestinians above all. The sense of ownership of the narrative and the ambiguities around who could say what was crippling–or at least, extremely anxiety-inducing. And, again, on a political level, not being a political theorist myself, I still felt shut out from the meaning of the one state or the binational state. How would it function? What were its particulars? Would it be a leftist egalitarian fantasy, such as the one Martin Buber had in mind, founded on socialist values? Would it be a right-wing expression of the full annexation of the land, as it seems today, with endless displacement and real estate speculation? The sense of ownership of the narrative and the ambiguities around who could say what was crippling–or at least, extremely anxiety-inducing. I again thought back to the coexistence my ancestors experienced under the Ottoman Empire, and I began to wonder if the very form of the nation-state was to blame. Was this social form simply unable to hold my people in all their complexity? If so, how could it hold both Jewish and Palestinian peoples? Was our adherence to a state impeding a path toward something like codetermination or interdependence? I began to think that the nation-state was an inadequate container for the complexity that is us. The shared complexity that might connect us across selves and across tribes. Seeking two nations, or a bi-nation, or a new nation, would never solve this intrinsic problem. So again, I turned my attention away from political reality. I drifted toward the idea that the flag was a post-nationalist symbol, an icon of borderless culture. Former ideas returned: could it be the flag of the Mediterranean? A flag of the Levant? A flag of a Federation of Middle Eastern states, as my dad had proposed? Or a flag that represented non-Ashkenazi Jewry in solidarity with Palestinians or Muslims? Or was it more abstract? Was it the flag of a feeling? A flag of impossibility? A flag of imagining? I felt that we had to go beyond Israelis and Palestinians, beyond Jews and non-Jews, in order to expand our sense of the possible. My new idea: we need to design a new social form before we begin to build a truly various movement. The obscurity and strangeness of this undertaking brought me into the realm of art. Inventing new forms was a Modernist tradition I had been fascinated by, in its violence and its grandeur, from an early age. Could we accept that spirit and try to reimagine what history had done to us? In this more imaginative, mysterious zone, from 2015 to 2016, I was driven by the idea that this flag was a poem—not unlike the poetic object David Hammons, the African-American sculptor and conceptual artist, designed: the black nationalist flag, combining the black nationalist colors and the American flag. David Hammons described the flag, which–before it was more broadly adopted–hung outside his gallery shows (most famously his retrospective at PS1), as a flag that would demarcate the space to gallery-goers as a place beyond the laws of the American nation. Conceptualism for him brought him into the realm of refuting the real to create room for something new. Inspired by this, I wrote a series of poems that would become a book called A Flag of No Nation, which meditated on my family’s history in building the Israeli state as Sephardic Jews and the story of the oscillation between hope and despair that was their participation in the construction of this culture. I began to trace that fine, long spectrum between possibility and impossibility that I had been shuttling between since my first home on earth in the air force base outside of Tel Aviv (my mother an ESL teacher to new immigrants near the air force base; my father an air force instructor who taught young pilots and some of the first Israeli astronauts to fly F-16s) to my removed and confusingly precarious yet bourgeois existence in Brooklyn. I began to trace that fine, long spectrum between possibility and impossibility that I had been shuttling between since my first home on earth in the air force base outside of Tel Aviv to my removed and confusingly precarious yet bourgeois existence in Brooklyn. I learned about the real and ordinary people who had designed the Israeli and Palestinian flags (a Jewish-American graphic designer from New York; an exiled Palestinian literary society in Istanbul). I saw myself reflected in these ordinary stories. I, too, was connected to an intimate arts community. I, too, was a kind of designer, working my day job, with my heart thousands of miles away. I wondered why I couldn’t be another ordinary person who could shift the regime of signs that have been hanging over–in turns animating and in turns obscuring–our sense of the possible. I dug deeper. I continued to listen to my grandparents’ stories and began to record them. I learned more about their growing disillusionment with the elements of the project they had begun in 1949. They had committed their lives as leftists and socialists to working for the foreign service in Ethiopia, Romania and France. They were some of the first Israeli diplomats in Africa, meeting with the Ethiopian Jews when Hailie Selassie was King. They had participated in the Munich retributions. They had served in 67, the Yom Kippur War. My grandmother was a translator and speechwriter for Yitzak Rabin and worked the in the offices of Peres and Meir. Both grandparents were instrumental in the creation of the state and the pursuit of the dream. Yet my father told me, after sixty years serving the state, my grandfather said on his deathbed that the state couldn’t last as is. That if it didn’t change, it would lose its soul. vision. When strange night turns into lawful day. your name. A flag is pulled from the flag. on the ground, ripe, for as long as we need them to. of song. Together, we lift the corners of the light. forms over our history, and that which is unwritten. banner of darkness, we share new light. We practice. As it is now, it is an inquiry into the very possibility of itself. What place or no-place should it represent? What promised land? What promised people? What causes and peoples could its iterations represent? To track from poem to political reality. A Binational state – the lowest hanging fruit, a real and necessary movement. A Middle Eastern Federation of States? A flag of Sephardi/Mizrahi, non-European Jews? I meet you here asking you to co-imagine this with me. The hamsa is an apotropaic symbol: a symbol that attracts the viewer’s gaze, while simultaneously turning it away. Typically worn as an amulet in order to protect the wearer from the evil eye, the hamsa in its new formation–on a flag–intends to serve as a collective ward against the evil eye. The colors of the flag, turquoise and copper, signify activation. In some craft traditions, the turquoise stone is used as eye at the center of the palm. 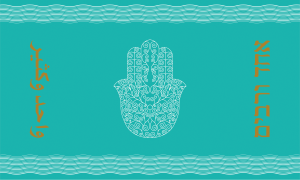 In the case of this flag, the turquoise eye has been abstracted into the background, into an ocean of turquoise behind the open palm. The rays that emanate from the palm are copper, the element (Cu) from which the compound Turquoise is created via the process of oxidation in water. Thus the flag’s image reveals an elemental, latent source resting on the backdrop of an activated Turquoise expanse. The hamsa in this formation is designed to represent a vast, shifting, hybrid community of many tribes and beyond the very notion of tribe–of many nations, and beyond the very notion of nation, emerging from a common elemental source. Tom Haviv is an artist and writer based in New York. A Flag of No Nation is his debut book of poetry. He is the co-founder of the publishing collective Kaf.